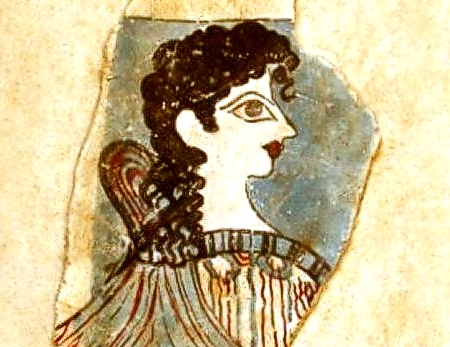 A fine reproduction of the famous fresco painting "La Parisienne" aka "Minoan Lady" found in the palace of Knossos in Crete. The sacral knot worn at the back of the neck seems to indicate that she is a priestess or even a goddess. The fresco is called La Parisienne because of the elegant appearance of the lady depicted. Dated to 1400 BC.